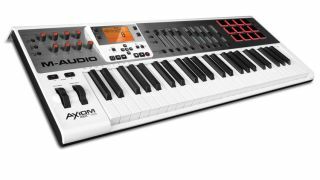 NAMM 2013 PRESS RELEASE: Cumberland, R.I. (January 24, 2013) - M-Audio has added three new Axiom AIR models to the upper echelons of their popular Axiom USB/MIDI keyboard and pad controller lineup: the Axiom AIR 61, Axiom AIR 49, and Axiom AIR 25. Created in conjunction with AIR Music Technology, these keyboards were designed to deliver a high level of integration with a broad array of music software titles. These new models join the previously released and compact Axiom AIR Mini 32. Unlike other keyboard controllers that include trial and demo versions of music software, M-Audio's strong partnerships with AIR Music Technology and Avid® allow each Axiom AIR 61, 49 and 25 model to come complete with two exclusive and complementary music creation applications: Ignite by AIR and Pro Tools® Express from Avid. "Ignite was designed from the ground up to provide instant integration and controller mapping with Axiom AIR and every M-Audio keyboard. This is one less thing a musician has to worry about when inspiration strikes." From Ignite, musical ideas can be easily migrated to the included copy of Avid Pro Tools Express, providing customers with access to the production capabilities of the industry- leading DAW software. Avid Pro Tools Express includes the required iLok USB key - a $49.99 retail value. The bold white and brushed metal design of the Axiom AIR series features many aesthetic and ergonomic enhancements not found in previous generations of controllers. These features include illuminated knob and pad controls, angled backlit display, longer-throw faders, and clearance under the body providing a path for cabling, keeping studio and workspace tidy. Pitch bend and modulation wheels allow for spontaneous expression, while octave/transpose buttons allow the keyboard to cover the entire note range, in any key. In addition to measuring how hard you strike, the pads also respond to pressure for enhanced control. Both keys and pads feature a wide range of touch curves to match any playing style. The pads, buttons, and rotary encoder knobs feature three banks of controller assignments; the current bank is indicated by tri-color illumination. All controller assignments can be freely made from the front panel and easily identified using the dedicated Identify button. The unique Pad Learn function makes it easy to assign instrument sounds to pads. Best yet, each Axiom AIR model features M-Audio's HyperControl to automatically map the controllers to popular recording software and virtual instrument titles. Ideal for the modern beat-making musician, the Axiom AIR 25 offers a generous 16 pads and 25 synth-action keys—with aftertouch. Assignable controls include 8 rotary encoder knobs and 1 long-throw 70mm fader. Balancing size and features to satisfy a broad range of players and composers, the Axiom AIR 49 features 12 pads and 49 synth-action keys—with aftertouch. Assignable controls include 8 rotary encoder knobs, 9 buttons, and 9 long-throw 70mm faders. Providing the accomplished keyboardist with an inspiring playing experience, the Axiom Air 61 delivers 61 TruTouch, semi-weighted keys with aftertouch. Assignable controls include 8 rotary encoder knobs, 9 buttons, and 9 long-throw 70mm faders. M-Audio will be exhibiting at Booth 6700 at the 2013 Winter NAMM show, January 24-27 in Anaheim, California.